BOSTON (JTA) — In the despair of the Soviet Union’s fierce World War II battles against the Nazis, a 42-year-old Jewish man from Odessa wrote a song in Yiddish poking fun at Hitler’s failures to seize control of Ukraine’s coal and oil resources. 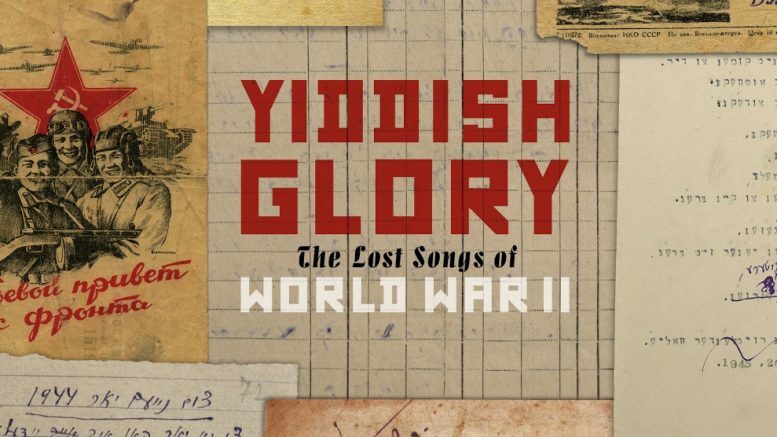 Now, following an unimaginable series of unlikely events, these rare and revealing songs, presumed lost to history, were rediscovered and have been brought back to life in “Yiddish Glory: The Lost Songs of World War II” (Six Degrees Records). The recording has been nominated for a Grammy Award, among five finalists in the world music category. The winners will be announced on Feb. 10 in a live broadcast from the Staples Center in Los Angeles. “Yiddish Glory” is among the fewer than a handful of Yiddish-language recordings to have been honored by the Recording Academy. The Klezmatics scored a Grammy in 2007 for best contemporary/world music album; at the time, awards in world music were divided between traditional and contemporary. In 1982, the Klezmorim were nominated for best ethnic album. “Yiddish Glory” represents a multi-year, ambitious undertaking led by Anna Shternshis, a professor and scholar of Soviet and Yiddish culture at the University of Toronto, and Pavel Lion, a Russian-born musician and scholar of Yiddish literature who goes by the pseudonym Psoy Korolenko. The recording, hailed on scores of best of 2018 album lists, includes 18 tracks. The extensive liner notes include lyrics for all the songs in English and Russian translation, as well as fascinating background material and archival images. Jews from all walks of life wrote the first-person lyrics — from Jewish Red Army soldiers and refugees to victims and survivors of Ukrainian ghettos. They ring with defiance, revenge, love, hope and Jewish humor. “Given the whole history, where it all started, … it’s unbelievable,” she told JTA in a phone interview. She recognized the find as a historical and cultural treasure trove. “I was shocked on so many levels,” said Shternshis, recalling when she delved into thousands of pages of yellowed, sometimes tattered paper with typed or handwritten lyrics. Steeped in the history of Russian Holocaust literature and music of the region, she was incredulous that she didn’t recognize a single song. The songs were notably distinct from music from Vilna, Warsaw and Lodz, with references to Stalin and the Soviet Union. Only about 10 percent of the songs included musical notation. Some referenced or gave hints of popular tunes of the times. “On the High Mountain,” the first song, leads with the soulful call of David Buchbinder’s trumpet. The lyrics are a nod to an old Yiddish counting riddle; Korolenko’s lively melody recalls that famous folk tune. Several songs offer ground-level, vivid descriptions of the massacres in Babi Yar, Tulchin and Pechora in Ukraine. “Mames Gruv” (My Mother’s Grave) is a child mourning the death of his mother sung by Isaac Rosenberg, Shternshis’ son, who was 11 at the time of the recording. He is beyond thrilled that he’ll be attending the Grammys, said Shternshis, who has to miss the ceremony. The fifth cut, “Mayn Pulemyot” (My Machine Gun), describes a Jewish soldier’s pride at using his machine gun to kill German soldiers. “Shelakhmones Hitlern” (Purim Gifts for Hitler) strikes a lighter note in comparing Hitler with Haman, the villain of the Jewish holiday of Purim. Milman brings smooth, sultry vocals to “Kazakhstan,” a cabaret-style ode of gratitude to the land where a quarter-million Jewish refugees survived. It’s the only song on the album in which Erdenko composed a new tune, combining Roma, Yiddish and Romanian styles. The song is deeply personal for Milman, whose grandmother survived as a Soviet Jewish refugee in Kazakhstan, and for Erdenko, as a tribute to the Roma who were also victims of the Holocaust. “They felt it was important to try to share their personal stories, their warnings against fascism, and their dreams for a better future in the faint hope that these stories would someday be heard,” he wrote in an email. Be the first to comment on "A collection of Yiddish songs was thought lost forever. Now they’ve been nominated for a Grammy."